So I was inspired by Johannathemad’s amazing Voltron fusion designs and decided to try making my own, and I figured who better to start with than with team Voltron’s resident head-butters, Keith and Lance? maybe I’ll make some comics out of this concept? At the very least I’ll design all the fusions-- I’ve already got Shallura sketched out so that’ll be coming up soon hopefully! I think of the same idea i couldnt deside on what look to give it. The outfit i was thinking of was purple and based of of garnet's outfit mixed with paladin armor. 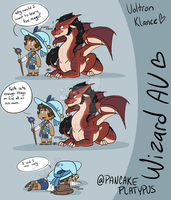 Keith would be saphire and lance is ruby. I see lance as ruby because he's a hot headed big mouth, he's more likely to say "I'm an eternal flame, baby! ", hi's atention seeking tendencies and because he's the more dumb one of the two. And Keith is saphire because he's the cool-headed one, at least on the outside. Bottles his emotions and is a man of few words like her. I guess I can see that. Although, I disagree on Lance being hot-headed. As well as I wouldn't call Keith cool-headed, he actually seems hot-headed to me. But I guess they both share traits with both of the gems. But RIP Lance, he is probably the dumber one. (Unless it comes to fighting then Keith is. We have an example from when Lance held Keith back in I think one of the (or the I don't remember if there is more than one) Balmera episodes.) Anyway, I do like it like that. It's certainly interesting. So now I don't know which gem fits which boy better! Lance is a long distance air and water assualt unit type lapis lazuli. Keith a future seeing aristocratic ruby with pyrokinetic abilities installed for self-defense. Pidge, like amethyst, is an overcooked emerald that was given the duties of a regular peridot instead of a quarts soldier. Shiro a prototype of the failed black pearl series project. A project designed to make pearls with battle capabilities. But he didn't came out as they expected. A blow to the arm left it permanently damaged. A limb enhancer was installed and the project was cancelled considered a failer and the pearl was given the name onyx and given to white diamond(Alfor). Allura alf human daughter of white diamond. I don't know very much about steven universe and the gems, but I do like those ideas. Although I thought in your head Lance was ruby and Keith was lapis lazuli? I changed a few gem roles here and there, plus Lance looks beter as a lapis lazuli instead of a saphire. Ack, I meant to say Saphire. For a gem AU, do you think Lance fits Ruby or Saphire better? (I don't know if those were their names, but I don't remember them...) same question for Keith.